For this next part we shall conclude the analysis of the political sphere of global development, and then venture into the economic sphere, and examine how the world is even at present, unifying and blending their economies so that they are apparently inextricably linked together, just as scripture said it would be thousands of years ago. "the 'house of world order' will have to be built from the bottom up rather than from the top down...but an end run around national sovereignty, eroding it piece by piece, will accomplish much more than the old-fashioned frontal assault." Note here a tactic that has long been utilized in the world by the Power Elite: the proverbial frog in the gradually heated pot of water. The “piece by piece” method is of course subtle, and difficult to detect on an overt basis, as opposed to the more obvious “frontal assault”. "We must join with others to bring forth a new world order...Narrow notions of national sovereignty must not be permitted to curtail that obligation." 1975 -- Retired Navy Admiral Chester Ward, former Judge Advocate General of the U.S. Navy and former CFR member, writes in a critique that the goal of the CFR is the "submergence of U.S. sovereignty and national independence into an all powerful one-world government..."
"Once the ruling members of the CFR have decided that the U.S. government should espouse a particular policy, the very substantial research facilities of the CFR are put to work to develop arguments, intellectual and emotional, to support the new policy and to confound, discredit, intellectually and politically, any opposition..."
"In my view The Trilateral Commission represents a skillful, coordinated effort to seize control and consolidate the four centers of power -- political, monetary, intellectual, and ecclesiastical. All this is to be done in the interest of creating a more peaceful, more productive world community. What the Trilateralists truly intend is the creation of a worldwide economic power superior to the political governments of the nation-states involved. They believe the abundant materialism they propose to create will overwhelm existing differences. As managers and creators of the system they will rule the future." "...a pervasive system of thought control exists in the United States...the citizenry is indoctrinated by employment of the mass media and the system of public education...people are told what to think about...the old order is crumbling...Nationalism should be seen as a dangerous social disease...A new vision is required to plan and manage the future, a global vision that will transcend national boundaries and eliminate the poison of nationalistic solutions...a new Constitution is necessary." "The Cold War should no longer be the kind of obsessive concern that it is. Neither side is going to attack the other deliberately...Sooner or later we are going to have to face restructuring our institutions so that they are not confined merely to the nation-states. Start first on a regional and ultimately you could move to a world basis." This gives us an indication for the time table in “The Plan”. By necessity nations will need to give up their sovereignty and conglomerate into ‘regional districts’ such as the European Union. There is proposed behind closed doors, and actions have already begun in forming a North American Union. As well as these, a South American Union, an African Union, an Asian Union . . . even a Middle East Union if you can even conceive of that are all on the drawing board! Once these Unions are established, and functioning, all that remains is to link these together, and a one world government is in place and incumbent. "World progress is only possible through a search for universal human consensus as we move forward to a new world order." "You're going to prove [Sen. Joseph] McCarthy was right, because all he was saying is that the system was loaded with Communists. And he was right . . . I'm worried about the kind of book you're going to write and about cleaning up McCarthy. The problem is that everybody said he was a liar . . . I agree that the Party was a force in the country." "The crisis in the Persian Gulf offers a rare opportunity to move toward an historic period of cooperation. Out of these troubled times...a new world order can emerge in which the nations of the world, east and west, north and south, can prosper and live in harmony....Today the new world is struggling to be born." "What is at stake is more than one small country, it is a big idea -- a new world order...to achieve the universal aspirations of mankind...based on shared principles and the rule of law....The illumination of a thousand points of light....The winds of change are with us now." June, 1991 -- The Council on Foreign Relations co-sponsors an assembly Rethinking America's Security: Beyond Cold War to New World Order which is attended by 65 prestigious members of government, labor, academia, the media, military, and the professions from nine countries. Later, several of the conference participants joined some 100 other world leaders for another closed door meeting of the Bilderberg Society in Baden, Germany. The Bilderbergers also exert considerable clout in determining the foreign policies of their respective governments. "What Congress will have before it is not a conventional trade agreement but the architecture of a new international system...a first step toward a new world order." Remember that before the E.U. there was the E.C. or European Community, and before that there was E.F.T.A. or European Free Trade Association. E.F.T.A. was for all practical purposes a blue print for our current N.A.F.T.A. and here Henry Kissinger states that this is more about a first step toward a new world order. If we follow the same pattern as Europe, what will the next step be here in America? A North American Community, followed by a North American Union, a socialist body comparable to the E.U. So, when do we the people get to VOTE on whether or not we want this?? 1995 -- The State of the World Forum took place in the fall of this year, sponsored by the Gorbachev Foundation located at the Presidio in San Francisco. . . the meeting of who's-who from around the world including Margaret Thatcher, Maurice Strong, George Bush, Mikhail Gorbachev and others. However, the term "global governance" is now used in place of "new world order" since the latter has become a political liability, being a lightning rod for opponents of global government. And the trail of the Goblins continues into the 21st century as well: Here is a web link to an intermediate course in Political Science currently being taught and deals with Global Government from a scholastic point of view; interesting to see how students will become familiar and adept with this issue as a functioning dynamic that will be implemented practically in the future. In summation for this section of a New World Political Order, it’s abundantly obvious that the world leaders in government and business industries, educators, media moguls, and others hold favorably to the idea of global government that will be socialist in nature. You might ask, what’s so wrong about socialism? I would refer you back to the article by A. Kisly (The GRAVE CONDITION of AMERICA’S WORLDVIEW) and review the concepts as laid down by Karl Marx; you would do well to read Mr. Epperson’s book The Unseen Hand, that deals with this issue from the start in chapter One. The following section will deal with the third primary sphere of global development, the new world economic order. In the unlikely event that there are some who are not yet aware of the strange symbolisms on the back of the one dollar bill, I’d like to go into it briefly; for the rest of you who are already familiar with all of this, I beg your patient indulgence. Look at a one dollar bill, reverse it to the side that has the green ink, and a “ONE” prominently in the middle. Look to the left of the “ONE” and you see a pyramid without a cap stone (its just flat across the top) with an eye at its zenith. Around this “Great Seal” are some Latin words which are as follows: “Annuit Coeptis Novus Ordo Seclorum” which translated states: “Announcing the birth of the New World Order”. 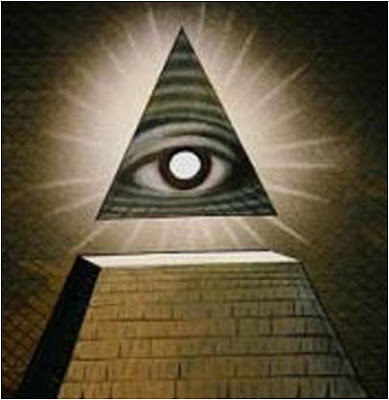 That eye at the top of the pyramid is actually the Eye of Horus, the Egyptian god of light, reason and knowledge. In any event, it’s not a Christian symbol and certainly if it were, it wouldn’t be placed over a pyramid. This is an ancient symbol that was used by Adam Weishapt in his (Bavarian) Illuminati, but didn’t originate with him; its actual origins is unknown, but some believe that it came from secret orders in Egypt or even Babylon. Most Masonic members recognize that the “Eye of Horus” is really the Eye of the ‘Great Architect of the Universe’, a euphemism for Lucifer. So what is it doing on an American dollar bill, in a nation founded on Christian ideals and principles? Many ascribe the founding fathers as being Masons, and not at all as Christian men. The theories and allegations will rage on, no doubt. However, for purposes here, I don’t have to go that far back to show that the men who promoted this ‘Great Seal’ as something that belongs on the dollar bill for being the nefarious, un-Christian and certainly Masonic in principles and ideals, mystically minded men that they were. Even if outlines a triangle over that pyramid, and then invert it over the letters (forming a 6 pointed star), five of those six points point to the letters A-N-S-O-M. which in different order spells out “MASON”. Coincidence? Hardly! So what does all of this have to do with a one world economic order? Such forces in the Masonic Society, and the unseen Illuminati agents that hide amidst other like secret societies, governments, and powerful global organizations are intent on forming a one world system that will one day fall in submission to Lucifer as their rightful god who will rule this world overtly, demanding and receiving worship from all. Precisely as the Bible laid out thousands of years ago. UPDATE 10/19/2009: Bilderberg Group orders destruction of US Dollar?